It’s the age-old question: if you clean the vacuum cleaner, do you not become the vacuum cleaner? By now you’ve started your Spring cleaning routine and you’ve soaped up your vents and washed your cars. You’ve probably also been using your vacuum a fair amount as well. 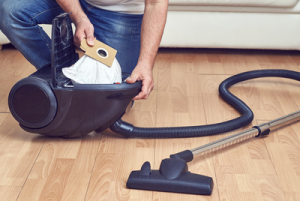 Though it may seem counterintuitive, vacuum cleaners can get very dirty and are rarely cleaned. That’s why in part three, the final post of our Spring Cleaning blog series, we will focus on giving this machine some TLC. The first thing you’ll do is empty the cannister or bag on your vacuum. This is something that should be done outside, or in a garage if possible, to avoid spreading dirt and dust around your house. You might need to shake the cannister to help jostle some of the stubborn dirt out of it. Apply your all-purpose cleaner (see below) to a cloth and wipe down the outside and the inside of the cannister. Be sure to wipe down all parts of the vacuum that are accessible, including the cord and outside of the hose. I don’t think it needs to be said that you should never apply moisture to the plug itself. Wash the filter next. This is generally at the top of the cannister and is one of the most important parts of the vacuum. When you rinse it, use cold water, but no soap. Run it under the water until no more dirt comes out. Allow the vacuum to sit in the sun so that everything dries completely. Do not replace the parts unless they are bone dry, or else your vacuum becomes a breeding ground for bacteria, and then we have to start this process all over again. The next not-to-be forgotten step is to cut all of those tangled hairs out of the beater bar. Be warned, this process can be unsanitary, so disposable gloves are advised. Using scissors, cut out all of the hair that has been wrapped around the bar. After, disinfect the bar with a cotton ball or rag. This part of the vacuum can be very unsanitary because of all of the dirt it comes in contact with. Now that your vacuum is clean, you can finally check Spring cleaning off of your list, which is good, since it’s practically summer by now. Hopefully, at the end of all of this, your environment will be cleaner and better off. If not, there is always next month’s blog.